About every two to three years, PGE’s contract tree crews will visit your area to inspect and prune trees along power line rights of way. During storms, trees cause the majority of power outages in our area. That’s why the Oregon Public Utility Commission regulations require us to do this pruning work, which helps prevent outages and downed lines and maintain a high level of safety and reliability. We follow precise standards and practices in maintaining trees. Our experienced contract crews are directed by PGE foresters who have extensive education and training in both urban forestry and electrical safety. Which trees will PGE prune? As we rotate through our service territory, our foresters examine trees for trouble spots. We look for branches that are close to power lines as well as branches that could fall during a storm and hit a line. We also search for diseased or dying trees. Our crews will work on any trees determined to be a possible threat to power lines. Usually, these are trees that are planted directly below the lines in a parking strip and have grown too tall. But we sometimes will prune the branches from an off right-of-way tree if it is getting too close to the power line. The general rule is eight to 10 feet of clearance. PGE’s top priorities are to ensure safe, reliable power while also guarding the health of the tree. That’s why we won’t just arbitrarily cut a tree. If, for example, the branches of a large elm or oak completely surround the power lines, we often prune out a u-section in the middle of the tree to provide plenty of clearance for the lines. This is much healthier for a tree than reducing its entire tree canopy. Our tree crews are highly trained and must meet a stringent qualification process. They undergo a two-year apprenticeship during which they study tree biology and tree pathology, as well as how to work safely around power lines. Each year they safely prune thousands of trees. We’ll send you a letter when we’re planning to work in your neighborhood. Or, you can email us if you would like to know when we’re planning on working in your area. Watch a short video about how our vegetation management program works. 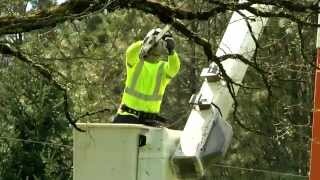 PGE offers free chips in neighborhoods where our crews are actively trimming. Learn more.